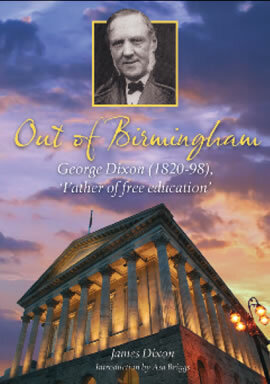 Local author, James Dixon, has published a new book about the critical role his great-great-grandfather played in the advent of free education in this country. George Dixon, the radical MP for Birmingham, established the National Education League in 1869. There had been many attempts at reform in the nineteenth century but they had generally been unsuccessful often due to religious issues. Dixon's pressure group was instrumental in persuading William Gladstone, the recently elected Liberal Prime Minister, of the need for action. Forster’s Elementary Education Act of 1870 was the outcome. James Dixon describes it as the most important social legislation of the era. Dixon's Putney connection is not only a family one. He rented the Fireproof House at the top of Putney Hill for the critical six month Parliamentary session in 1870 when the Bill was being debated. There is a photograph of all that remains of the Fireproof House [an obelisk alongside the slip road from the A3 to Putney Hill at Tibbetts Corner, accessible through the undergrowth behind the Telegraph Inn] in the book. The book describes the career of the independently-minded Yorkshireman who entered politics alongside John Bright and Joseph Chamberlain. Already a successful merchant, his input into the educational debate was substantial. He became one of the country’s longest-serving School Board chairmen. He also set up, using his own money, a pioneering School which bears his name and still flourishes today – The George Dixon Academy. But educational reform was by no means his sole preoccupation. He became involved in changes to local political organisation. He made his name locally and nationally as the Mayor who bravely quelled the Murphy Riots. He supported the agricultural workers in their disputes with the farmers. And he supported them financially if they wanted a better life abroad, especially in New Zealand. After a career as a tax accountant James Dixon went on to study history at Royal Holloway, University of London. He has lived in Putney since 1970. His book entitled 'Out of Birmingham' is available on Amazon for £14.95 for the paperback version and £19.95 in hardback. All royalties will be passed on to the Prisoners Education Trust.